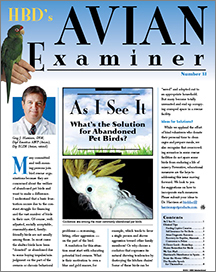 The Avian Examiner is a free avian medicine newsletter that is created by HBD International and is distributed several times every year. Subscriptions are available to veterinarians and veterinary clinics who carry or sell HBD products. It includes articles written by vets, practice tips and avian medicine news. Maryland pesticide seminar. Hemochromatosis in a psittacine. Garlic to repel mosquitos. Landmarks for intraosseous catheter placement. Making Baytril palatable. New HBD client booklet. HBD Super Fine formulas. (Rainforest Conservation, Bevel Orientation for Jugular Venipulture, Chronic Dermatitis in a duck, much more..). (Calcium Metabolism: effects of husbandry article, Parrot Walk in The Netherlands, much more…).